Authentic yakisoba with sauce, made with pork, cabbage, carrots, and non-kansui noodles. Cooked in a specially made sauce over an open fire. Package is 400g total (2 servings) and arrives frozen. 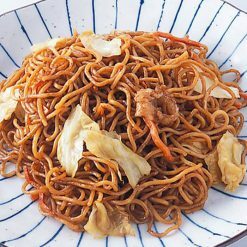 Yakisoba is a Japanese noodle dish in which the noodles have been cooked or fried in a pan. Though the name includes “soba,” which often refers to buckwheat or partially-buckwheat noodles, yakisoba is often made from wheat. Yakisoba can be eaten by itself, or put into a hot-dog bun to make yakisoba-pan (a food frequently seen for sale at train stations and convenience stores in Japan). 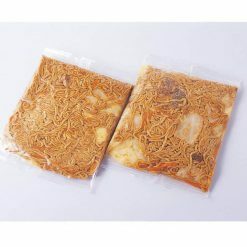 This yakisoba can be prepared easily, using just your microwave! Ingredients such as amino acids and hydrolyzed protein were not used in making this product. Take the yakisoba (still frozen) from its outer bag. Punch air holes in the inner bag in 2 to 3 places, and microwave. (In a 500W microwave, cook for about 5 minutes. In a 600W microwave, cook for about 4 minutes 30 seconds). This product contains noodles (wheat flour, wheat protein, sea salt, egg whites, eggshell calcium), ingredients (cabbage, carrots, pork), sauce [sweeteners (sugar, dextroglucose fructose liquid sugar), vegetables/fruits (apples, tomatoes, onions, garlic), flavoring extract (yeast, wheat gluten, oyster), table salt, soy sauce, brewed vinegar, starch (corn, wheat), spices], frying oil (rapeseed oil, corn oil, sesame oil), caramel colorants.. This product is not suitable for anyone with allergies to egg, wheat, soy, pork, apple or sesame. Origin of ingredients: cabbage, carrots, pork (domestic). Prepared and packaged in Japan.